Kate from Discover. Create. Live. 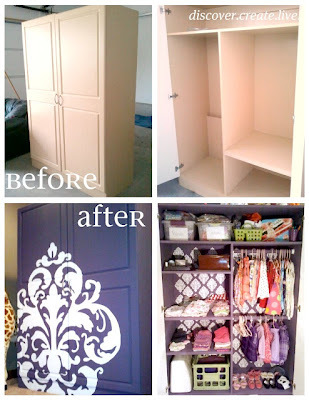 put her own spin on a Pinterest-inspired piece of furniture that makes a huge impact in a room. Click on the picture below for a detailed tutorial to learn how to make your own. Kate blogs over at Discover. Create. Live. She is happily married to her high school sweetheart Wes, and they have a beautiful little girl named Hayden. She loves to blog about their family, gluten free cooking, and lots of different projects they tackle to help beautify their home. In addition, she likes to post different printable "graphics" each week as well as the things that inspire her. Connect with Kate! Marie of All Things Luxurious has a great post all about layering patterns, and it made me think of one of my favourite designers, Sarah Richardson. She's notorious for it! Click on the picture below to get some great insight into this frequent designer dilemma. Maria blogs at All Things Luxurious -- a place where she explores the wonderful world of interior styling and design for the modern decorator. She's new to the blog world and would love some more company in her cozy corner of the Internet. Pull up a chair, settle in with a hot mug of coffee, and go check her out!